Patients who are concerned about stubborn abdominal fat but who wish to avoid more invasive treatments and long recovery times have an excellent alternative to consider — Vanquish ME. Vanquish ME is the first non-invasive and non-contact procedure that permanently eliminates unwanted body fat without pain or recovery. The treatment uses radiofrequency energy to treat areas where clients want more tone and contouring safely. And you can have a Vanquish ME treatment at Spa Sydell today. Vanquish ME is an FDA-approved, non-invasive, non-surgical and non-contact treatment which safely and effectively eliminates unwanted body fat. 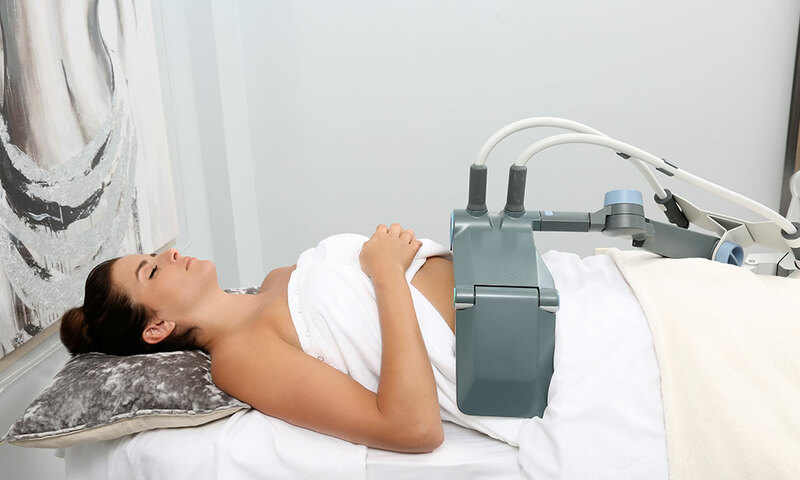 The procedure heats targeted fat cells with highly controlled radiofrequency energy. The heat delivered through the RF energy heats fat cells causing their death while leaving other cells unaffected, thus permanently reducing abdominal fat. Vanquish ME uses radiofrequency energy to target and treat unwanted fat in problem areas. Radiofrequency energy is a form of electrical energy used extensively and safely in a wide variety of medical applications. RF energy penetrates the deeper layers of the skin, heating targeted fat cells while easily passing through other cells, leaving them unharmed. When fat cells are heated beyond their capacity, they die and will be eventually carried from the body through natural processes. Your body will eliminate these dead fat cells but not regenerate new ones, leaving you to enjoy improved tone and contouring in the treated areas with long-lasting and permanent results. What are the benefits of a Vanquish ME treatment? Individuals who wish to improve their body contours, especially around the abdomen and flanks, will find many benefits in a Vanquish ME treatment. What areas of the body can Vanquish ME treat? Am I a candidate for Vanquish ME? Men and women over 18 years of age who are in good physical health and near their ideal body weight make good candidates for a Vanquish ME treatment. Individuals should also maintain a healthy lifestyle, which includes diet and exercise, to prevent additional weight gain after having Vanquish ME. Talk to your Spa Sydell medical provider about alternatives if you have these conditions. What will happen during my Vanquish ME treatment? Patients should stay well hydrated before their Vanquish ME treatment and also avoid any dehydrating activities, such as high-intensity sports, prior to treatment. Alcohol and caffeine intake should also be limited beforehand. Keeping your skin well hydrated will improve the effectiveness of your Vanquish ME treatment. During treatment, you will feel a gentle warming sensation. A Vanquish ME treatment is comfortable, and most patients do not need any pain medication. A Vanquish ME treatment typically lasts between 30 and 45 minutes. Does Vanquish ME have any downtime? You may feel thirsty or slightly fatigued after your treatment; however, these symptoms are natural and will quickly subside. They do not prevent most people from returning to work or their regularly scheduled activities. What can I expect during recovery from my Vanquish ME treatment? After Vanquish ME, your skin will feel warm to the touch, and it will remain warm and look slightly red for up to two hours after your session. You may also experience some mild swelling, which will also pass within a few hours. These side effects of treatment are mild, natural and temporary. What results can I expect from my Vanquish ME treatment? Patients can expect to lose approximately 2 inches of fat from their waist after their Vanquish ME treatment; however, individual results may vary. Some weight loss may also accompany your improved tone and contours. When will I see my Vanquish ME results? Typically, patients begin to see a reduction in their waistline approximately two weeks after their final Vanquish ME session. Results will continue to develop in the following weeks as your body naturally eliminates dead fat cells. How long will my Vanquish ME results last? Fat cells treated by Vanquish ME are killed and eliminated from the body over time. Your body will not regenerate new fat cells, making your Vanquish ME results permanent. Spa Sydell has served clients in the Atlanta area for over 30 years. We offer personalized, client-focused care, impeccable surroundings and personalized spa and cosmetic treatments. Spa Sydell has a singular focus — to ensure our clients always look and feel their very best. Spa Sydell offers massage, facials and manicures and pedicure services, in addition to leading cosmetic treatments, such as laser, injectables and fillers. You can relax, recharge and improve many skin concerns safely and comfortably at Spa Sydell. Call Spa Sydell today at 404-255-7727 to schedule your visit or consultation. Spa Sydell invites you to enjoy a full suite of spa services which will relax and re-energize you, including massage, facials and manicures and pedicures. To ensure that you always look as good as you feel, Spa Sydell also offers leading cosmetic treatments which include fillers, laser and injectables. Call Spa Sydell at 404-255-7727 to schedule a visit or consultation today.